The Organization of Luso-Americans at Rutgers, OLAR, is organizing a trip to Santo Antao, Cabo Verde during Spring Break 2019. Cabo Verde is an island that has faced serious economic and environmental issues for decades. Rutgers OLAR hopes to extend their reach and impact to the Cabo Verde community by teaching technology, branding, and finance to its residents. To find out more about OLAR's mission or to donate, please visit PROJECT CABO VERDE for more information. Portuguese is the sixth most spoken language in the world with more than 230 million speakers. Portuguese is also the fastest growing European language after English and Spanish. Brazil is the largest economy in South America and the eighth largest in the western hemisphere. With rapid economic development in Brazil, becoming familiar with the Portuguese language remains beneficial for individuals in all fields. The Portuguese major program provides students with the opportunity to develop their Portuguese language skills while also studying the literature and culture of Portugal, Brazil and African lands of Portuguese language or influence. They may also combine their Portuguese studies with other areas to prepare for career opportunities in international business, government, travel or communications, where knowledge of a foreign language and culture is indispensable. A Portuguese major is a good complement to a major in another foreign language or to certicate programs such as the Global Studies Certificate. Students who have already studied Portuguese for two or more years in high school or who speak Spanish in the home and wish to continue the language are assigned to courses according to their achievement on a placement test. NOTE: You will not receive credit for any course taken below your placement. For more information on courses, program studies and events, please visit the Center for Latin American Studies website. Laboratory programs are an integral part of most language courses. SAS Language laboratories provide services, equipment and facilities to all language students. Laboratories are located on the College Avenue and Douglass campuses. For more information about laboratory hours and locations, please visit The Language Center website. 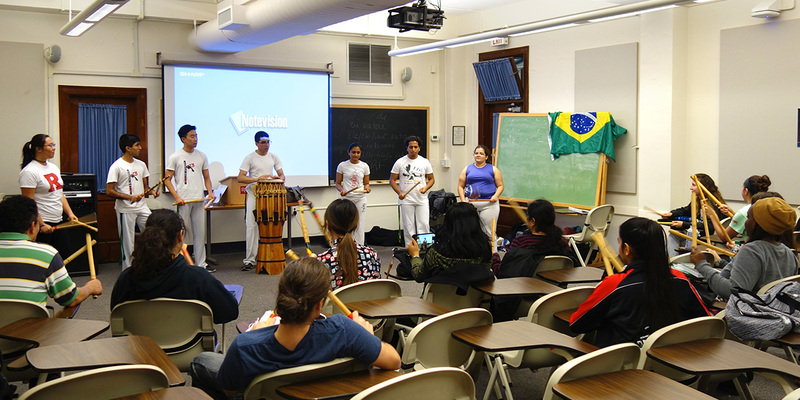 The Department of Spanish and Portuguese encourages students to strengthen their knowledge and appreciation of the Latin culture by participating in the other cultural organizations throughout the university. Lambda Theta Alpha, Latin Soroity, Inc.
Sigma Lambda Beta, International Fraternity, Inc. The Department of Spanish and Portuguese has adopted a no-tolerance policy for e-mail and other electronic messages, including class discussion sites or forums, addressed in an intimidating or threatening tone.